Check headcount before setting buffets or plated meals. Serve items in small, individual serving vessels instead of chafing dishes. Separate mixed items when possible to give guests choice while maintaining freshness. Use dispensers, jars and dishes with lids to preserve food quality for reuse. Reduce plate size and shrink serving utensils. Offer small utensils for sample servings at the buffet. Use temperature controlled vessels to preserve food quality. Set certain high value items as a la carte. 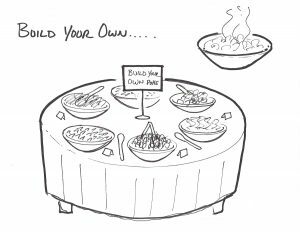 Place conscious consumption cues on the buffet to engage guests in waste reduction efforts. Use service stations at the buffet to control portion size and maintain food quality. Put out increasingly smaller chafing dishes and top off or back fill when necessary. Facilitate communication between banquet and culinary staff to relay buffet supply status and enable a la minute replenishment. Use real time updates between banquet staff and culinary staff to communicate food supply status of buffets to optimize replenishment. Dedicate food waste bins to banquet breakdown stations. Track the waste and enable feedback to culinary on which items went unused, overset or wasted on guest plates. Inform future procurement and meal prep with this data. Use blast chilling equipment to preserve food quality for reuse or recovery. WWF engaged IDEO, a human-centric design firm, to prototype strategies for buffet waste reduction at The Hyatt Regency Orlando. IDEO and property staff tested interventions in the event sales process, guest messaging, use of technology, and buffet service standards. Staff were enthusiastic to engage and eager to propose opportunities for reduction within their operations. After interviews with meeting planners and event attendees, and 3 days onsite at a property, IDEO developed 17 solutions to the key drivers of waste during buffet service. 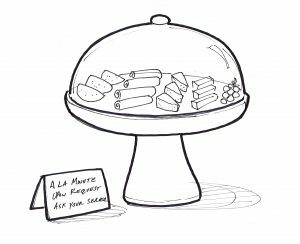 One strategy for reducing buffet waste is to catalog uneaten food returning to the kitchen to understand how guests are consuming specific items and what could minimize this overproduction. In one project, a sous chef noticed significant amounts of potato salad left in serving vessels and on plates. He noted this to his chef and program lead. For future events, the chef cut down the portion size per guest, which resulted in observed reductions in post-service waste, with no impact on guest experience.